Through the beauty and generous sharing of her music, and through the kind of person she was, Linda created a wide network of friends and fans. As part of honoring Linda and that network, we welcome you to create or reply to comments in the Comments area farther down this page. You can also upload images as part of the comment process. This entry was posted in In Memory on Friday, February 1, 2019 by admin. It has been over three weeks since Linda passed away. But to me it feels like just a few days, and I’ve been wondering why. Although Linda had a side to her that was very down-to-earth, she also seemed to live a lot in another world, one that most people are not so familiar with. Remembering our experiences as friends and colleagues, I feel myself slip into that other world, where time slows down and everything just is as it is. 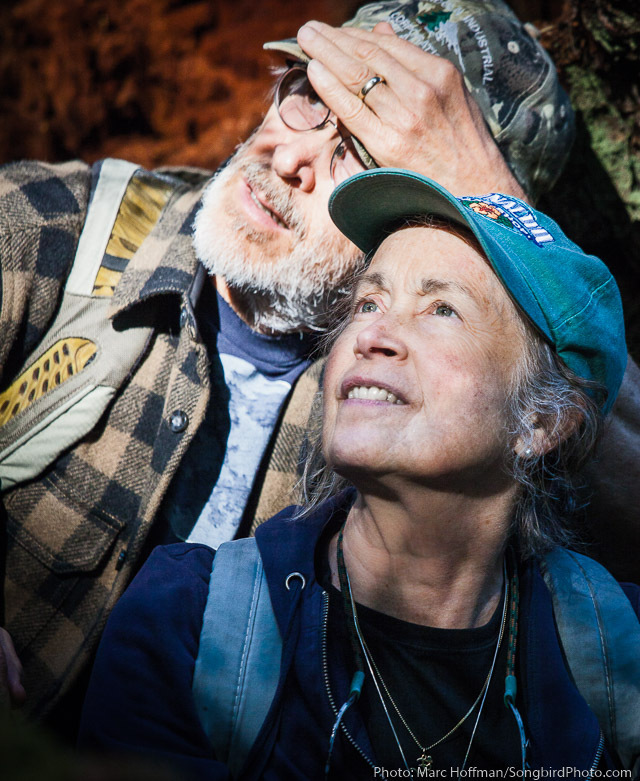 Here’s a photo of Linda and Bob hunkered beside a wise old tree on the Olympic Peninsula in 2012. In this photo shoot, Linda switched costume from red to blue. Although she ended up using the red shots more, I always liked the way the blue brought out her slatey-blue eyes. Someone posted on Youtube this lovely video of montages of Linda photos shown over the song Hometown Girl. Gary Graves then posted it on the PSGW site. Sniff. I am sorry to see a Wallingford neighbor pass, leaving a hole in the community. Linda made a permanent, positive impression on me and I appreciate that very much. Thank you, Linda. The thought of you makes me smile. 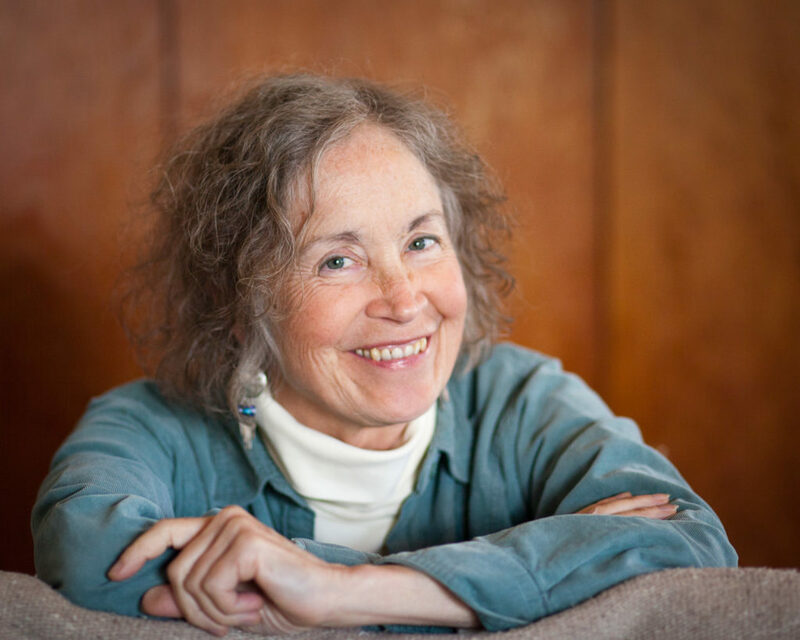 The universe—and our Northwest environs in particular—lost a treasure early this year with the passing of Linda Waterfall in January. 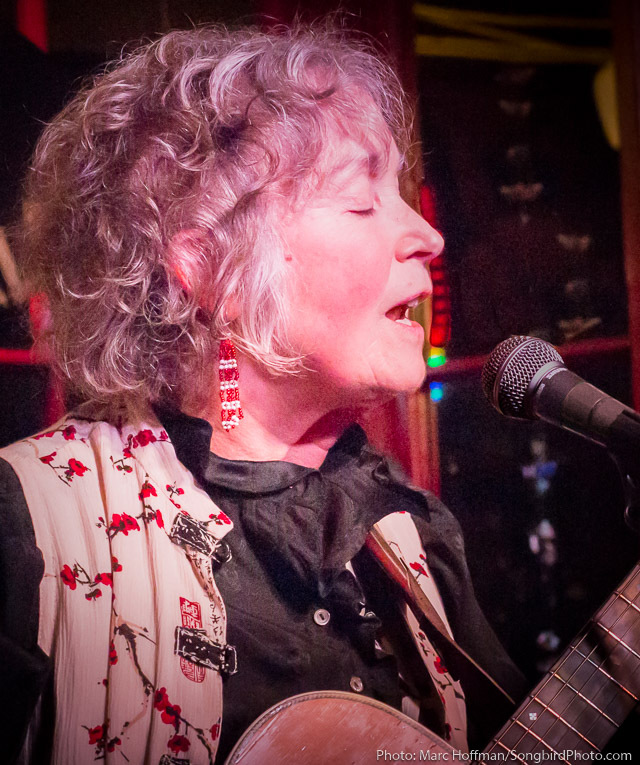 Paul de Barros’ obituary in the Seattle Times nicely recounts her musical résumé and significance to the regional scene, but Linda, like anyone, was an individual no single label nor box could hold. At the memorial a musical peer posed a simple question: “When did you first work with Linda?” I took a breath to answer and then stopped. When did we first work together? I certainly remember a time when Linda Waterfall (her real name) was a mythological figure in my understanding of Seattle songwriter-chronology, but for so many subsequent years she was a warm, accessible friend and colleague. And it’s just like Linda to oversee that transition in a way that would leave me unsure as to when we made the jump. A regional arts organization had hired me to adjudicate a song contest. My co-judges, I was initially told, would be Linda Waterfall and Dan Maher. The pay was excellent, as were the accommodations, and I looked forward to a weekend away with work and peers I enjoyed. At the pre-show production meeting, we learned three important things: first, there would be six total judges, not just the trio I was expecting; second, we six would sit on-stage through the whole performance and offer on-mic comments following each song, American Idol-style; and third, they’d flown the sound technician in from Texas. The volume of judges seemed excessive to me, but the sponsors clearly had money to spend and had chosen me as one beneficiary, so I wasn’t complaining. At least they weren’t asking us to make a consensus decision—the winners would be chosen based on aggregate scores. Putting us all on-stage was also not my choice for presenting the most compelling performance—contestants would have friends and family in attendance, and they likely didn’t care whether I thought the tune could use a bridge—but, again, I was mindful of the gift-horse in the room. And though I was convinced there were individuals capable of competent soundboard operation between our fair state and the Lone Star Republic, the organizers were certainly entitled to surround themselves with known quantities and friends, even if they made a big, frequent deal of it. The next day we raised the curtain in front of a sold-out theater, judges table in full view. Linda sat far stage-right, I took the seat next to her. The first few contestants offered their songs, we offered unexceptional responses and submitted our marks in secret; so far, so good. Then the sound went south. At first it was easy to shrug off—keeping track of constantly-changing personnel, all with instruments giving different sounds at different levels, is much tougher than most people realize, and occasional hiccups are bound to happen when cycling through a dozen-plus acts one after another. But the squealing persisted, loudly. As you might imagine, it became hard to stay focused on the performances. Still there we sat, under the same bright lights as those poor-but-resilient songwriters, who after weeks of build-up now had to contend with unrelenting feedback through their lone, respective numbers. I stole a discreet glance at Linda for inspiration, and of course she was gracefully composed and attentive, as though nothing but the song was happening, and that song drew her in like a dispatch from on high. Linda was eminently capable of receiving the message. I bit my lip and held on. Linda was a classmate of mine inthe New Trier Township high school class of 1967. She was one of a kind -beautiful in all ways, physical, emotional and spiritual. The kindest person I’d ever known.